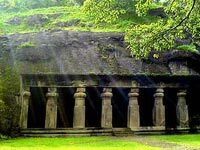 The Elephanta Island was so named by the Portuguese, after the statue of an elephant near the landing area of the island. The statue now stands near the Bhau Daji Museum in South Mumbai. 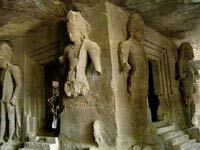 The rock cut caves, dedicated to Lord Shiva are rich in sculptural content. Every statue depicts a scene from Lord Shiva’s life. As we walk through all the corridors a guide will take you back in time explaining the rock formations and their existence. To reach the Elephanta Island (which is located 10 km off the coast of Mumbai), you have to take a boat from the Gateway of India. The first boat from Gateway of India leaves at 9 am (boats every 10 minutes) and the last returning boat from Elephanta Island is at 5.30 pm. You can have a splendid glimpse of the Arabian Sea and the sky line of Mumbai city while on your way to Elephanta Island. Sit back and relax in the boat as the accompanying guide begins to explain the history of the caves as well as interesting trivia about Mumbai city as well. The boat ride takes one hour to reach. The tour can begin any time between 9 am and 3 pm.